Look out for street vendors selling bottled water and chilled drinks. 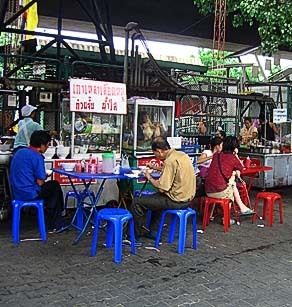 Deep fried fishballs and chicken satay, complete with little bundles of sticky rice, can be bought from vendors. Although basic looking these are often delicious as the vendors are specialists in their particular snack. Fresh fruits including bananas and chilled pineapple slices can give you an energy boost and cool down while not interrupting your shopping.